Victoria is taking steps to lead on climate change action, according to the Victorian Premier Dan Andrews. In an announcement on Thursday the Premier said an independent review of the Climate Change Act 2010 would be established to report to the government before 31 December 2015, and tabled in early 2016 along with a Government response. The committee will propose options to strengthen the Act, so it can provide a strong foundation for Victorian action on climate change. The original Act was passed with the support of opposition parties. After the election of the Baillieu Government most of the measures and targets were wound back or abolished in the legislation. The independent review committee will consist of Martijn Wilder AM as Chair, and members Anna Skarbek and Professor Rosemary Lyster. “We want to transition our economy to reduce emissions, in ways that grow the economy and increase jobs and the review of the Act will help us identify those opportunities.” said Lisa neville. This follows statements by the Victorian Energy Minister, Lily D'Ambrosio, addressing the Federal Government that Victoria wants to establish it's own Victorian Renewable Energy Target (VRET) and to get out of the way and clear the federal legislative path to do so. In late December 2014 Labor announced support for strengthening the Victorian Energy Efficiency Target program. Transition will require both building renewable energy and closing the coal mines and coal power stations that cost Victorians in health and pollution impacts over $3.7billion EVERY YEAR (Ward and Power 2015). An Economic Transition plan that engages with the community is required especially for the Latrobe Valley that includes support for new industries. When I was there on Saturday there was not a single wind turbine on the hills that surrounded Morwell. That needs to change. You need to give the people of the Valley hope after the devastation wrought on the community through the years of privatisation and the minefire. You can be a transformational Premier. On Wednesday June 3 I attended an event at the Plumbing Industry Climate Action Centre reviewing the first year of Moreland Council's Zero Carbon Evolution Program. Minister for Energy and Resources Lily D'Ambrosio was the keynote speaker. She spoke on maintaining Victoria's energy efficiency target (VEET) and in re-establishing a Victorian renewable energy target (VRET) one way or another. All very positive and I applaud these initiatives...but there was no mention of tackling our brown coal problem. It was the elephant in the room that was not discussed while Ms D'Ambrosio was there, but was voiced afterwards as part of audience questions in the panel discussion. 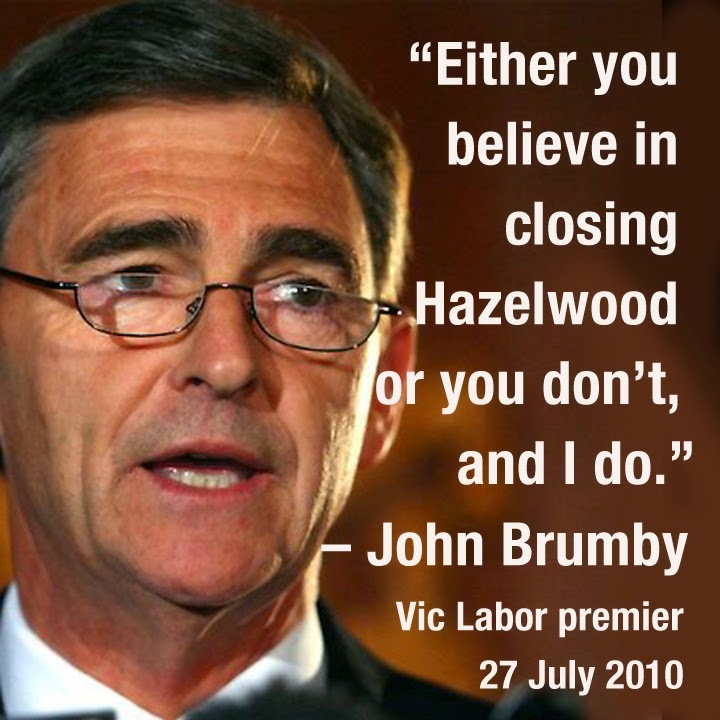 In 2010 Labor Premier John Brumby promised phased closure of the Hazelwood power station. Labor Premier Dan Andrews and his ministers have yet to make the same commitment. According to the June 2015 Pitt and Sherry CEDEX report for the electricity sector to May 2015 there was a rise of about 3.3% in emissions with National Electricity Market (NEM) with electricity emissions intensity increasing. The share of coal in the NEM increased to 75.3 per cent, the highest level since January 2013. For the third successive month total demand for electricity in the NEM increased very slightly with Victorian brown coal generators taking all the increase, and more. "Brown coal generation by itself reached 24.0 per cent, which is its highest share since the year to September 2012, just after the introduction of the carbon price." said the Pitt and Sherry Electricity Update for May 2015. This chart from the Pitt and Sherry June report shows the changes in electricity generation by fuel type, clearly showing the increase in combustion of brown coal, the worst in terms of carbon emissions. Expanding renewables and energy efficiency improvements need to happen, but the elephant in the room is the combustion of Victorian brown coal in the Latrobe Valley. Alcoa announcing the closure of Anglesea power station and mine in August comes as welcome news, but was on the cards once the Port Henry Aluminium smelter closed. Alcoa had the power station on the market for 15 months and could not find a buyer. It had become a stranded asset. It is the first Victorian coal domino to fall. There needs to be a phased closure of the power stations of the Latrobe Valley starting with Hazelwood. Such closure needs to include economic transition planning that engages with the Latrobe Valley community and provides new avenues for work and industry in the region. More generally, this UNFCCC video just published from the Bonn climate conference, talks about jobs in transition: building a bridge to the future with new skills, so that communities can rebuild in a sustainable fashion. Premier Dan Andrews and his Ministers need to start this process in the Latrobe Valley.